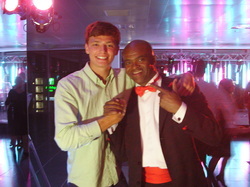 Tyler was invited to play for a dinner party hosted by Master of the Girdlers, Michael Roberts. He played jazz saxophone accompanied by Jon Hockings on guitar. It was a nice evening which ended with an invite for Tyler to come to a jazz concert . A night I'll never forget. Performing to a sold out Royal Albert Hall. 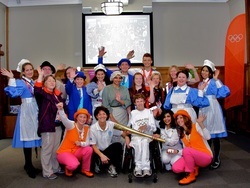 400th anniversary of Dame Alice Owens School and I felt so proud to be part of it. The atmosphere when I stepped out on to the stage was something I've never felt before. Daniel Marks accompanied me on piano. The following week the whole school and the Lord Mayor attended a service at St Paul's Cathedral, then I went to a champagne reception at Mansion House. 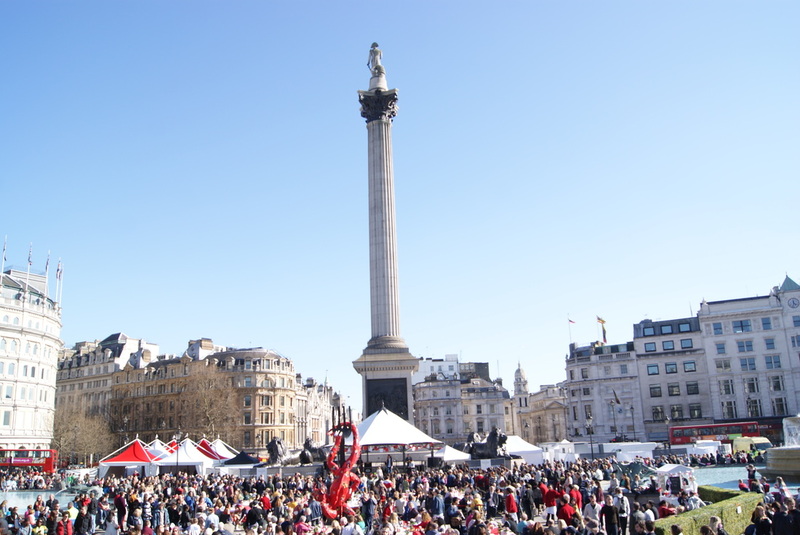 This weekend saw London shine with talent & perfect weather for the Feast Of St George Festival in Trafalgar Square 2013. Incredible atmosphere at my 2 latest gigs - Warwick Arts Theatre the same night I flew to New York for Fashion Week, and Altoria Club in Leamington Spa when I came back! Loved playing to the Uni Students, gonna start doing loads more Uni gigs. Tyler was invited to play for this Christmas party when he bumped into old school mate Richard's mum whose house he filmed the Biscuit Song in! The world gets smaller! He chatted to his local MP, the Rt Hon. Mrs Theresa Villiers who was very interested in his role in the Olympics and said it was great to have something different from the usual Christmas entertainment when he performed some of his singer-songwriter tracks. The very next night he bumped into him again at Hendon Town Hall together with his wife Lynda, the Mayoress, during the celebration party for the London Borough of Barnet's Torchbearers. Tyler was invited as guest and performer to the Installation Banquet of Alderman Gordon Haines as Master of the Painter-Stainers at Painters' Hall on 18th October. Tyler sat on the top table for dinner and afterwards Gordon presented both Tyler and his Principal Guest Lord Hall CEO of the Royal Opera House (now Director -General of BBC) with gifts. 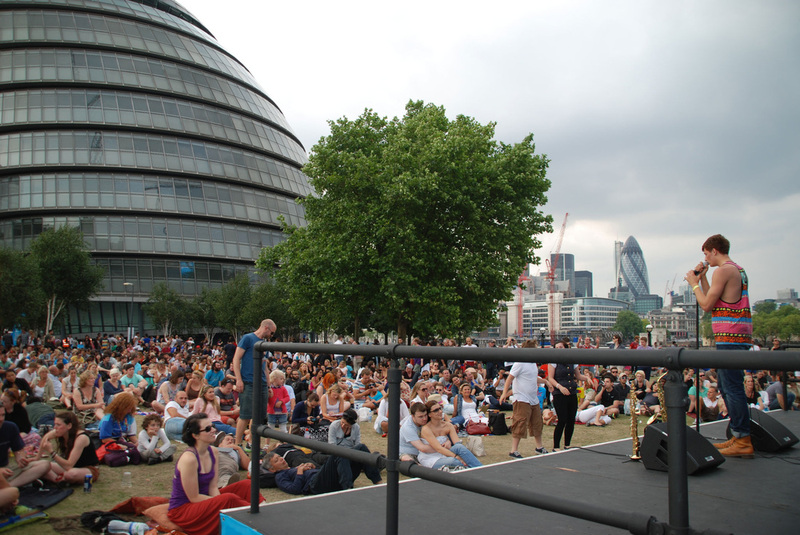 Tyler performed his latest tracks for the Mayor of London and all the GLA Team, marking the end of London 2012 Olympic Games with a huge celebration party at the prestigious City Hall. 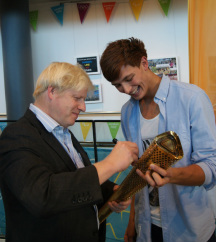 A hugely successful Olympics made for a really fun and happy evening that ended with Boris signing my Olympic Torch!!! This summer hundreds of young singers and musicians made London their stage in the city's biggest ever busking competition. 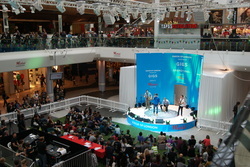 18 finalists competed in the Mayor of London's Gigs Grand Final at Westfield on 1st September, duo James Riley were crowned overall 2012 winners. 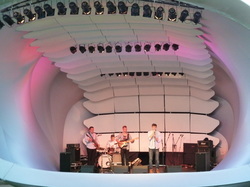 The Tyler Rix Quartet kept the audience entertained by playing their new tracks inbetween each of the three competition categories. We had dinner and drinks with 360' views over the Olympic Park and the London skyline, the evening was hosted by Baroness Ford of Cunninghame. Kriss Akabusi MBE accepted our invitation to join us up on stage to sing to 'Unlock This Love' and got everyone singing and dancing. A great night. What a setting! London is beautiful! We opened the show alongside the Thames and Tower Bridge with its 5 Olympic rings to 'Perfect Girl' which was much enjoyed! Gutted that I won't be waking up to play in the Olympic Park tomorrow!!! Sad to head off home for the Closing Ceremony of the Olympics after such a wicked couple of weeks. It was the best Summer of my life, one that I will never forget. 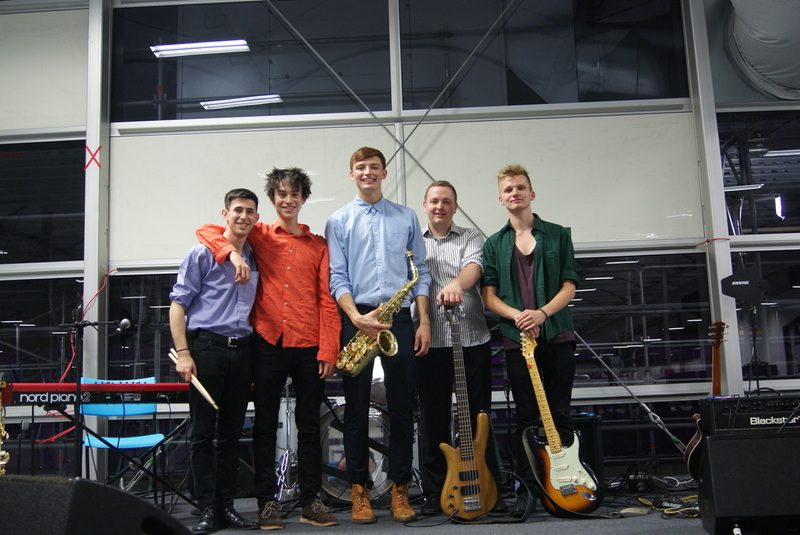 As no Olympics had ever had entertainment during their games, the Tyler Rix Quartet officially entertained the most amount of people and did the most amount of gigs at an Olympics in history!!! 23 gigs in the first 10 dates at the Olympic Park, there's a special buzz in the air, the atmosphere is incredible and we have met the some of the best people in the world, especially the Olympic volunteers. 250,000 people come to the Park each day and we've played and played to them spending nearly all our time here over the past two weeks with our breaks at BT London Live. Happy crowds sing and dance to our music. We even got to watch the mens' 100m semi finals looking into the athletics stadium from the top of the Orbit, then Usain Bolt win Gold three times. With so many Team GB Golds on the Park we are having absolutely the best time! Thanks Jeremy for the photos! 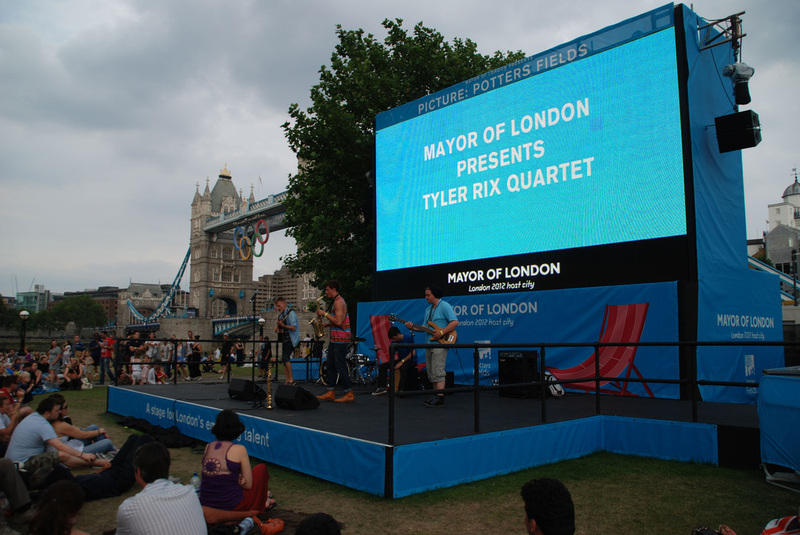 The Tyler Rix Quartet were invited to play at The Globe during the London Olympics and the Paralympics, the place where the athletes go to unwind. It was a great place to chillout and play. 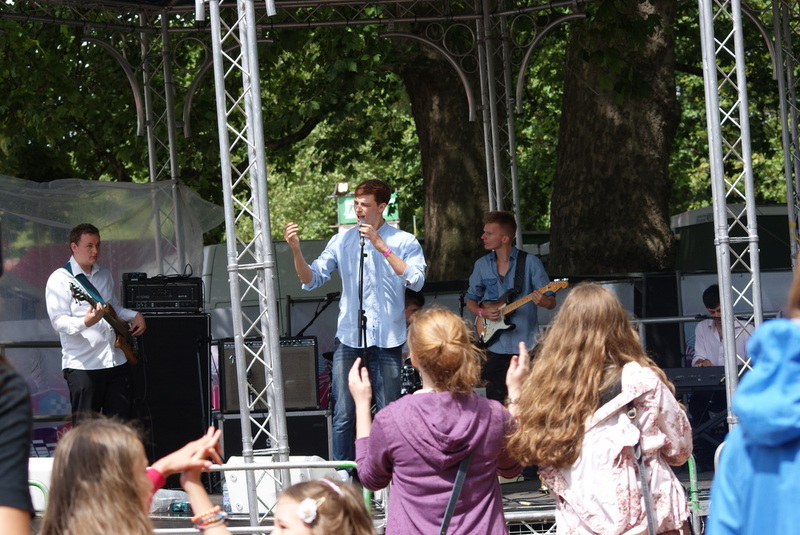 The Tyler Rix Quartet had people dancing in the rain until the sun came out. 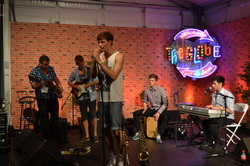 Tyler performed his latest singer-songwriter tracks on three dates with the Quartet along with some well known pop. Olly Sarkar took over from Tom Kelly on drums for one day while Rob Luft stepped in on guitar. 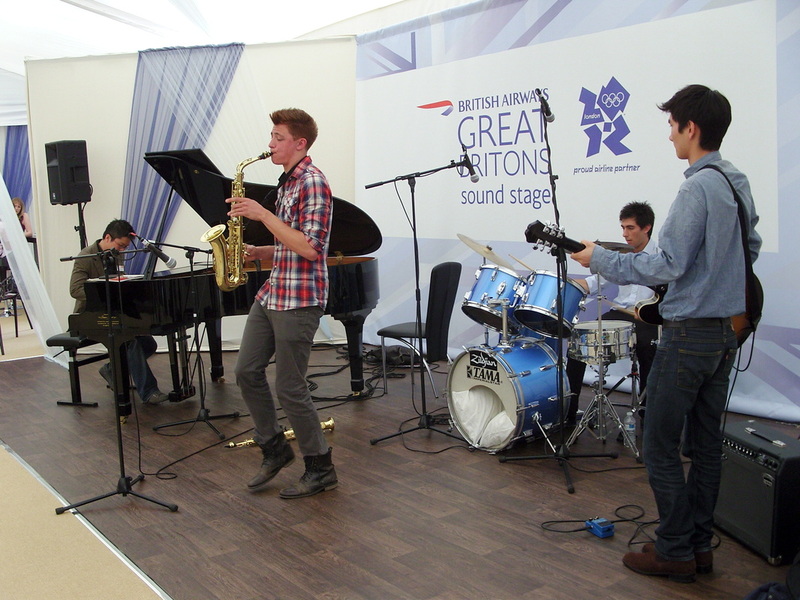 The Tyler Rix Quartet were invited to perform for the athletes, press and sponsors of the London 2012 Olympics as the live entertainment for the opening of the Athletes' Village on the Olympic Park on 29th June 2012. "It was an amazing atmosphere inside the Athletes' Village, we were absolutely honoured to be chosen play at this unique event." Talented Pete Torrington on guitar joined the Quartet for his first of many gigs and a wicked summer ahead! 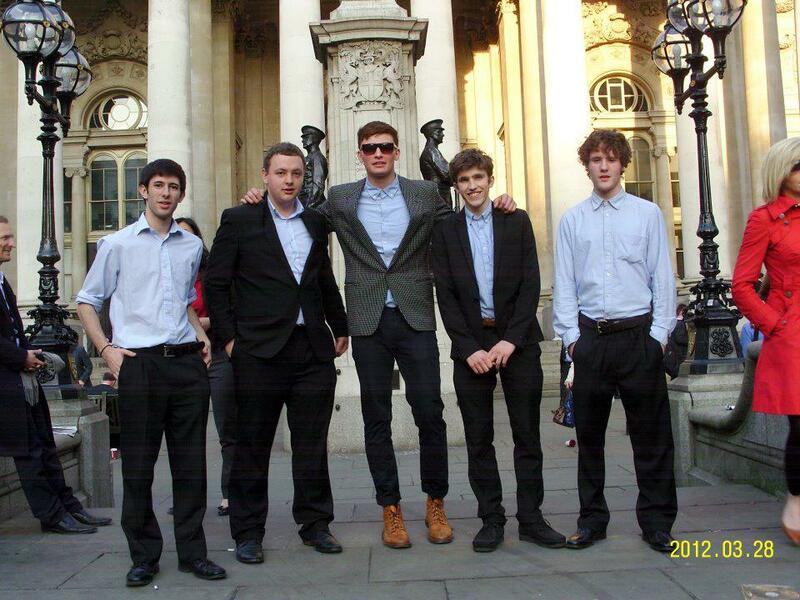 The Tyler Rix Quartet were chosen as the entertainment for this Young Achievers in the City celebration attended by young lawyers and bankers in Lombard Street. 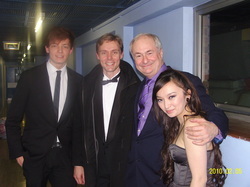 The evening was a great success with the Quartet playing a whole range of music from classical to jazz to pop to funk. Joe Armon-Jones and Will Arnold-Foster joined for the evening on keys and guitar. Brilliant Jack Polley on bass joined the Quartet for the first time, so we guess now it's a quintet! 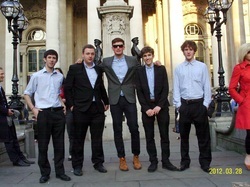 In September Tyler helped Barclays in a fundraising event for Barclay's Bank Legal Charity Art Auction . The Tyler Rix Quartet played two dates on the Great Britons Soundstage, playing for VIPs at this culinary festival presented by Channel 4 in partnership with British Airways. Great reviews followed, making Tyler front page of the 'Great Britons' Newsletter' sent to the London Organising Committee of the Olympic Games and their partners in 2010. 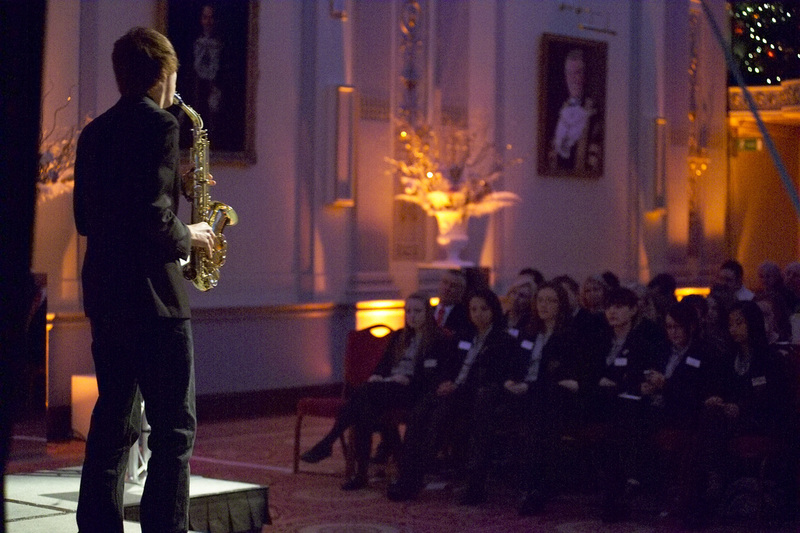 Tyler played as a young solo musician on two occasions to students, education and business delegates at the British Safety Council Awards. This charity educates the workforce in health and safety. Championing the safety of young workers, the www.britsafe.org educates youngsters in safety in what will be their first employments. Tyler played Beyonce's 'Listen '. 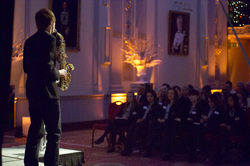 The Tyler Rix Quartet was the live jazz entertainment for the after dinner party at the House of Lords. The evening was hosted by the Speaker of the House of Lords following the Commonweath Conference 2011 attended by Barack Obama, Princess Anne and delegates from over 50 Commonwealth countries. Some delegates decided not to go for dinner because they were just 'diggin' it' ! Having been signed to the West Ham Academy Tyler helped The Bobby Moore Fund raise money on this successful fashion extravaganza night, organised by Alderman Gordon and Caroline Haines, hosted by DJ David Kid Jensen, Matthew Wright and Hardeep Singh Kohli. Tyler played his saxophone on the catwalk in an evening attended by many stars and footballing legends. On another event for the Bobby Moore Fund Tyler played on a boat down to the Hurlingham Club. An invitation from the Mayor of London gave the The Tyler Rix Quartet their biggest audience yet when they played for the St George's Day Celebrations in Trafalgar Square representing the best of London's young musicians and the quality of music education that's right here in London. It was a fantastic atmosphere on a sunny day enjoyed by an official estimate of 10,000 people. 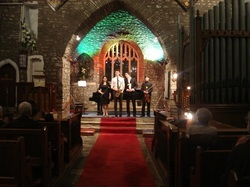 The Tyler Rix Quartet played in the Lower Machen Festival at Newport, Wales. 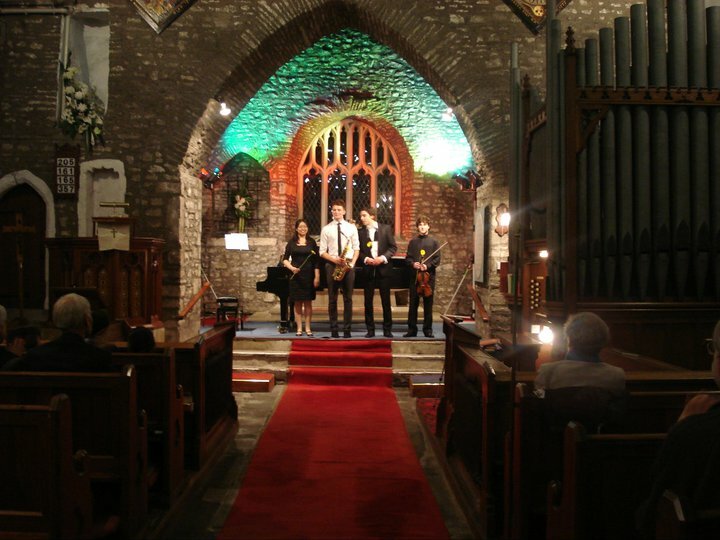 The following year Tyler was invited to play in the classical evening concert series featuring young soloists at the church in Lower Machen accompanied on piano by Louisa Lam. Tyler and Alex headed off to the Serenata Festival in Dorset to play a beautiful repertoire of saxophone with classical guitar at this classical music festival. They mostly remember it raining a lot ! 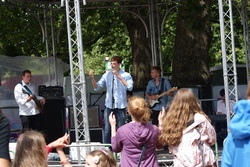 The Harpenden Festival was packed out with an audience of teenage musicians. Tyler played the first half as a classical soloist and the second half with the quartet introducing Jacob on piano for the first time. Tyler has accompanied singer songwriter Mesha Bryan in raising money for the homeless on a couple of gigs for Camden Calling. Tyler was invited to play for the Pink Lunch at Northbank Restaurant, London raising funds for Breast Cancer Research and the Bridewell Foundation. Tyler's saxophone playing to a backing CD was enjoyed at a family open day at St Hilda's Community Centre in Hackney. 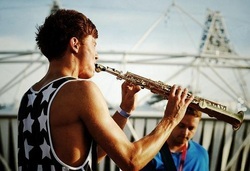 Tyler was invited as a guest saxophonist to play with the BBC Concert Orchestra. It was an amazing experience for a 15 year old to stand as a soloist with the full orchestra on stage and be broadcast live on BBC Radio 2 from a packed Mermaid Theatre. He performed Taxi Driver Suite by Bernard Herrmann and Eliza's Aria by Elena Kats- Chernin on his first visit, presented by Clare Teal. He was invited back for another Friday Night is Music Night broadcast presented by Paul Gambaccini where he performed Angela Morley's arrangements of Oblivion by Astor Piazzolla and Kehar's Theme from Watership Down. Tyler's invitations to lots of schools have included cutting the ribbon to open Frith Manor's 70th anniversary fair; guest speaker to inspire school leavers at West Hatch School, Essex and present their awards; an interview by Classic FM while taking workshops at Moss Hall School; joining St Michael's School at the Arts Depot for their school production of Music from the Musicals as well as lots of concerts and visiting schools as an Olympic Torchbearer to inspire children to achieve their best. 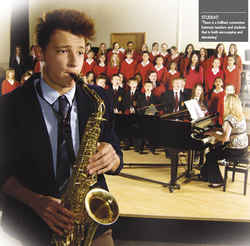 This picture is taken from Tyler's secondary school's prospectus, Dame Alice Owen's School in Potters Bar, where together with Alex, Tyler took part in a non-stop calendar of musical events ranging from orchestras, classical performances, singing with Owen's senior Chamber choir who went on to finish 4th internationally at Llangollen Eisteddfod's music festival 2 years running , jazz gigs, soul band, acting as the 'Dentist' in 'The Little Shop Of Horrors' ...... playing for the launch of the charity 'Music First' at the Barbican, an organisation which provides opportunities for young people of all backgrounds to come together and create music, http://www.musicfirst.org.uk/ and for the re-opening of Islington Assembly Hall. Since leaving Frith Manor Primary School for secondary school, Tyler has refereed the Children v Teachers match every summer . 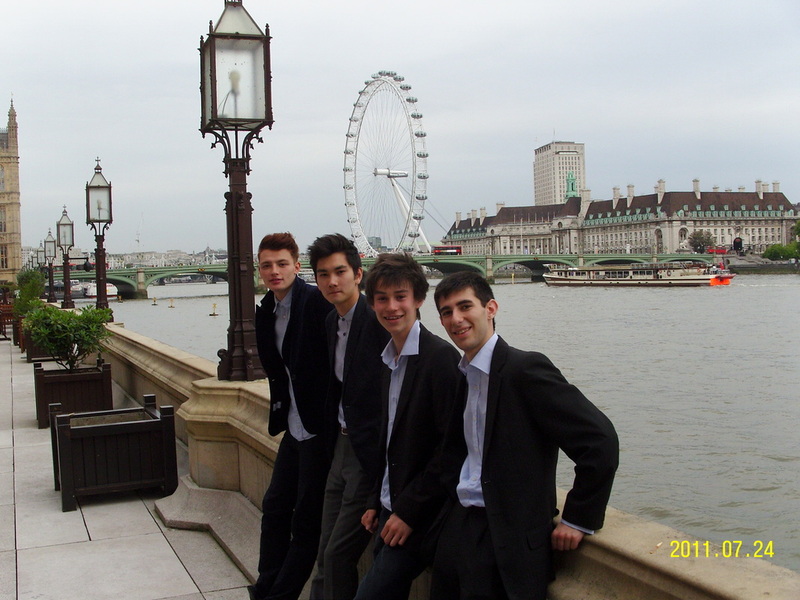 Tyler Rix and Daniel Marks both auditioned aged 10 for the Junior Department of Guildhall School of Music and Drama, one of Europe's leading conservatoires. Both attended on Saturdays for the next eight years. 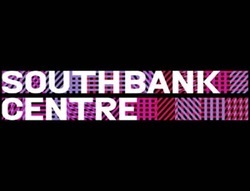 They were given numerous exciting opportunities to play in both classical and jazz performances, including concerts at St Martins-in-the Field, St John Smith's Square, Royal Festival Hall Southbank and The Barbican Centre during their time there. Amazingly both Tyler and Daniel each went on to win Junior Guildhall's annual prize for performance, the prestigious Lutine Prize. Tyler in 2008 and Daniel in 2009. So it's fantastic to hear them in the Quartet together! Although at separate music universities, Tyler and Daniel are currently composing a range of classical, film scores, pop and jazz music.